Colombo (AFP) - Sri Lanka's state energy provider sought divine intervention Thursday to break a crippling power shortage, dispatching envoys to the country's north to offer holy water to a tree sacred to Buddhists. The island nation has endured widespread energy shortages all week as a severe drought bites into hydro-electricity production, resulting in unpredictable blackouts and emergency measures to slash usage. Some businesses were hoarding fuel for generators, fearing the situation would not improve, as hours-long rolling outages forced Sri Lankans to sleep outdoors to escape the heat. 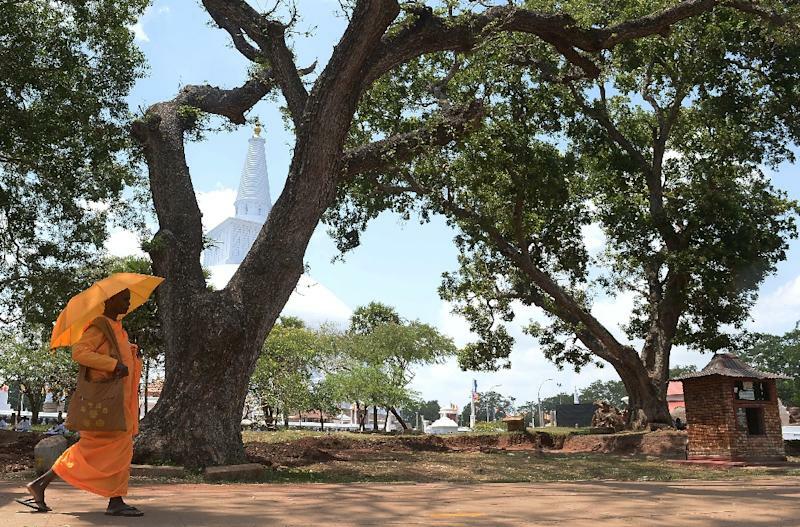 In the hope of provoking much-needed rain, the Ceylon Electricity Board said it would offer alms to the Sri Maha Bodi, a tree in Anuradhapura revered by the island's Buddhists. Pots of water blessed by monks were sent by motorcade to the Bodi, believed to have grown from a sapling of an older tree under which the Buddha attained enlightenment more than 2,500 years ago. "There will be several offerings at the bodi today and lunch will be offered to monks tomorrow after overnight religious ceremonies," a CEB official said Thursday. The tree is so revered in the Buddhist-majority country of 21 million that it is guarded round-the-clock by heavily armed security forces. The energy board this week abandoned efforts to stimulate rain through cloud seeding after earlier attempts failed. About a quarter of the island's electricity is generated by hydro plants, but capacity is approaching zero after the monsoon failed to bring adequate rains. The Public Utilities Commission of Sri Lanka said it would seek legal action against the state-owned Ceylon Electricity Board after receiving complaints about unscheduled power cuts being imposed across the country. The capital, Colombo, has not been affected but daily restrictions are being imposed everywhere else in Sri Lanka and residents have complained of random periods of "load shedding" without warning for the better part of a week. The shortages conjured up memories of the island's worst-ever power shortage in 1996, when the entire country went without electricity for four straight days.